There’s a reason that, after centuries of homemade potency potions that fell flat, the world went crazy for drugs like Viagra (sildenafil) and Cialis (tadalafil). It’s because they apparently work. So it’s no surprise that companies may be trying to mix these prescription drugs into their “dietary supplements” and hope that no one actually tests them. But as we’ve seen several times over the last few years, company after company has had to issue recalls of supplements because they contained these ingredients, which are only available with a prescription in the U.S. The latest batch of recalls of supplements that may do what they promise — but probably aren’t doing it with the ingredients listed on the package — come from a company called Eugene Oregon Inc., which, counterintuitively, is based in Pennsylvania. 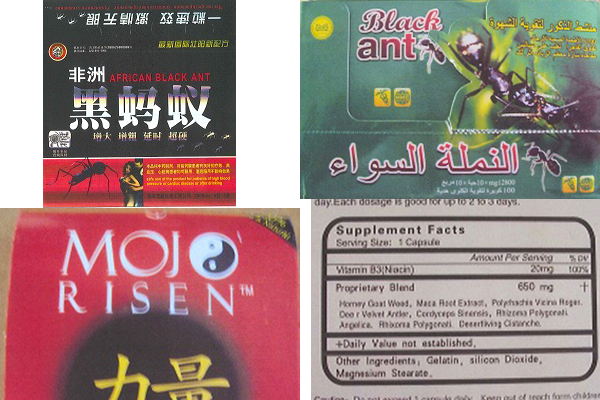 The three products are African Black Ant, Black Ant, and Mojo Risen pills. Third party testing of these products indicated undeclared amounts of sildenafil and tadalafil, prompting the FDA and Eugene Oregon Inc. to issue a recall. Prescriptions are required for sildenafil and tadalafil because these drugs can interact with nitrates found in some prescription drugs (such as nitroglycerin) used to treat heart disease, high blood pressure, cholesterol and diabetes, resulting in decreased blood pressure.